A recent photo, above, shows a Syrian government fighter manning a Russian Kord 12.7 x 108 mm heavy machine gun (HMG) in the eastern Jobar district of Damascus city. The belt-fed Kord is chambered for either 12.7 x 108 mm or 12.7 x 99 mm (.50 BMG), and has an effective range of up to 2000 metres. It bears a close resemblance to the earlier NSV, also chambered for 12.7 x 108 mm, and the two may be easily confused. As discussed in our recent guide to the differential identification of the Kord and NSV HMGs, the Kord can be positively identified in this instance by looking at the visible right side rear of the receiver, particularly the placement of rivets, which differ to those on the NSV. Another indicator, though on its own not as conclusive, is that the weapon is mounted on a bipod. The NSV was not produced with an integral bipod, and it is highly unlikely it could be effectively employed in such a configuration due to the strong recoil it exhibits in comparison with the Kord. A close-up showing the receiver of the Kord in the video, left, and a similar angle view of a NSV’s receiver for comparison, right. 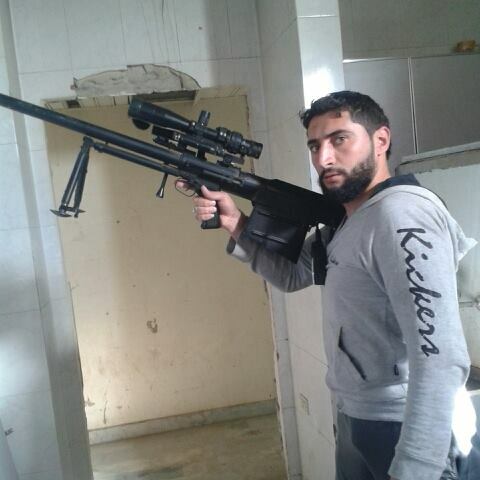 Another modern Russian weapon, the ASVK anti-materiel rifle, was photographed recently in the hands of an alleged Syrian soldier, seen below. The bullpup configuration ASVK is also chambered for the 12.7 x 108 mm cartridge, and began to be introduced into Russian military service in limited numbers less than two years ago. Although not previously known to have been exported, the ASVK has been documented in the hands of pro-Russian separatists in the ongoing Ukraine conflict in ARES’ latest Research Report. The OSV-96, another, slightly older Russian anti-material rifle, has also been sighted in Syria multiple times, like in this report from late 2012. 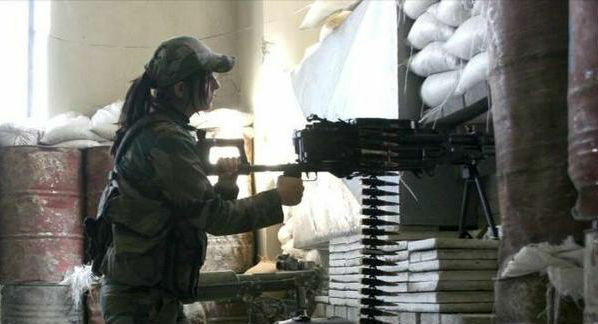 An alleged Syrian soldier with an ASVK anti-materiel rifle. Previous reports have covered the flow of arms from Russia to Syria, with one document outlining a request from the Syrian Director of the Army Supply Bureau to ROSOBORONEXPORT, the Russian state-owned arms export bureau, for arms and munitions including “500 KORD machine guns” and “100 12.7 mm sniper rifles”. Images from @SyTruth_Fighter and @pfc_joker. Special thanks to Jonathan Ferguson.